​​A ​banner at the ceremony held at Choeung Ek Memorial Center reads "Knowledge of past genocide is to prevent it from re-happening on Earth." For most of us, this was our first time traveling to Southeast Asia, and our knowledge of Cambodia’s past was pretty limited. In order to gain a better appreciation for the country and where it was headed, we visited the Choeung Ek Killing Field and Tuol Sleng Genocide Museum. First, we arrived at Choeung Ek on the hottest day of our two-week stay in Cambodia. At first glance, Choeung Ek is a peaceful place with lush greenery and a tranquil pond. During our visit, there was a ​ceremony in the courtyard with music and dancing, telling the story of the killing field and commemorating the ones who lost their lives there. About 17,000 men, women, and children were transported to this extermination camp between 1975 and 1978. The audio tour guided us from one ​landmark to the next, identifying mass graves and sharing the horrific experiences of some of the survivors. Fragments of bone and clothing are still being discovered in the fields after each rainy season. One of the most impactful aspects of Choeung Ek was the memorial stupa at the end of the tour. Inside the stupa are about 5,000 skulls of the victims executed at the site. On closer examination, many of the skulls bear marks of the trauma they suffered before their execution. Next, we took a bus to the Tuol Sleng Genocide Museum. It seemed strange that it was located in the middle of a bustling city with houses and shops nearby. Before the Khmer Rouge transformed the site into a prison and interrogation center, it was merely a high school. Each of us took the audio tour at our own pace—pausing on the benches to listen to the story of a victim or take a mental break. From room to room, we saw hundreds of photographs of the prisoners as they arrived (taken for record-keeping purposes), the mutilated bodies of the victims, and the soldiers who worked there. There were only seven survivors of the approximately 17,000 people that were imprisoned at S-21 Prison. Choeung Ek and Tuol Sleng provide an educational experience about the horrific and heartbreaking history of Cambodia. Much of the sites were left as they were found after their discovery, allowing you to step back into the not-so-distant past. Although it was a sobering day, it was necessary to learn about Cambodia’s past in order to better understand its future. The Choeung Ek audio tour includes stories by ​survivors and explains some of the techniques used to kill the prisoners, including children. The memorial stupa at Choeung Ek houses a display of thousands of victims' skulls. Upon arriving at S-21 Prison, each prisoner was photographed. 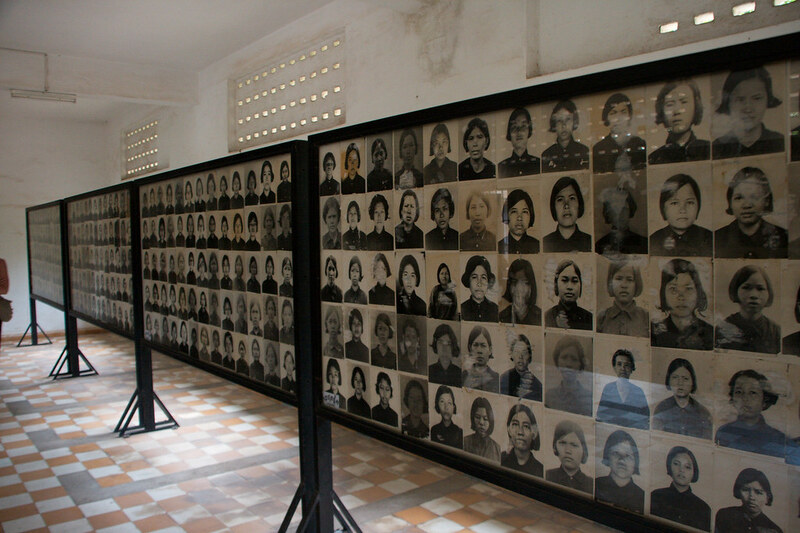 The haunting photos of the over 17,000 victims, including those of children and women holding babies, remain in Building B of the Tuol Sleng Genocide Museum. The Tuol Sleng Genocide Museum site is a former high school which was used as Security Prison 21 (S-21) by the Khmer Rouge regime from its rise to power in 1975 to its fall in 1979. Prisoners were shackled in classrooms ​converted into large mass detention cells or divided into many small brick cells. Signs at the museum indicate the "barbed wire prevents the desperate victims from committing suicide." Some buildings are preserved exactly as Vietnamese ​soldiers found ​them in 1979, including the bloodstains on the floor and the implements of torture left on the bed frames. A display at the Tuol Sleng Genocide Museum shows the 10 rules for prisoners at S-21 ​Prison. A former commander of the prison claims the regulations are ​false. In Case 001 of the "Khmer Rouge Tribunal," Kaing ​Guek Eav, alias Duch, commander of S-21 prison, said the regulations were a fabrication of the Vietnamese officials who helped set up the museum. Duch was convicted in 2010 by the Extraordinary Chambers in the Courts of Cambodia for crimes against humanity and grave breaches of the 1949 Geneva Conventions and sentenced to life imprisonment. Texas A&M Law student Joshua Ramirez with Chum Mey, one of ​the few survivors of S-21, at his booth outside of the Tuol Sleng museum. Chum Mey gave evidence ​at the "Khmer Rouge Tribunal" in 2009.